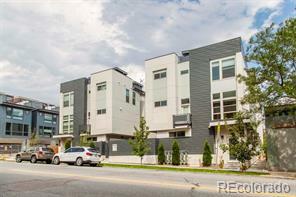 This spectacular townhouse at Zuni30 is the epitome of LoHi living. A light, bright and open concept layout with main level featuring a beautiful kitchen complete with european cabinetry, high quality stainless steel appliances, granite counter tops and custom- built pantry. Living room is accented with a sleek fireplace, large picture windows and plenty of room to entertain. Follow the open tread stairway up to two private suites. Master bedroom features dual vanity with quartz counters an oversized shower and large walk-in closet. Second bedroom also features en-suite bathroom and ample storage. Laundry conveniently located on same level as bedrooms. Enjoy the serene, private rooftop terrace which boasts stunning city and mountain views. Enjoy the convenience of an entertainment bar on the rooftop level, gas hook ups for grill. Attached two car garage and spacious entryway. Step outside your front door and the dining possibilities are abundant in every direction.